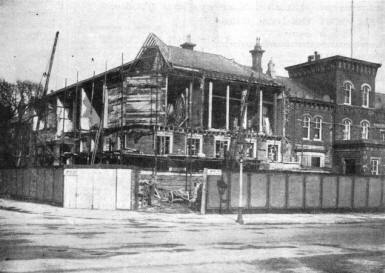 This picture shows the transformation which is proceeding at the corner of Dicconson Terrace and Central Beach, Lytham. The building left intact on the right is part of the old Assembly Rooms and the Yacht Club, and that from which the front has been pulled down is the old Urban District Council Offices. This has been incorporated in the baths reconstruction scheme. The builders are engaged on the new facade to the Beach and Dicconson Terrace, having rebuilt up to the first floor. The main entrance to the baths (at the rear of this building) will be in Dicconson Terrace, where a handsome stone portico is being erected. The entire scheme is estimated to cost about £30,000.